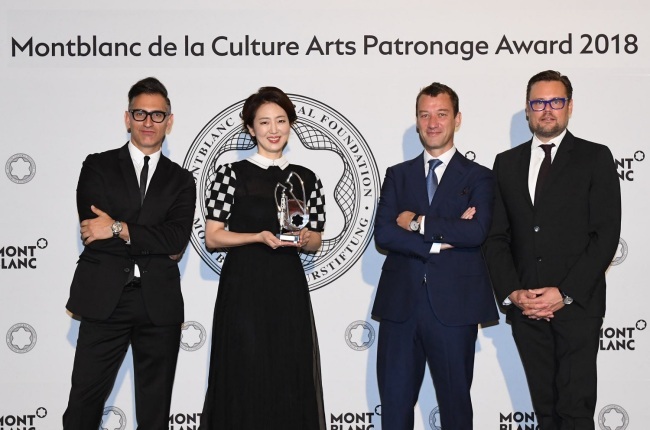 Choi Yoon-jung, chairwoman of the Paradise Culture Foundation under the resort complex operator Paradise Group, was given Montblanc’s Arts Patronage Award on Tuesday. The winners each receive 15,000 euros ($17,500) and the limited edition Patron of Art Edition pen. Seventeen patrons -- including Choi from Korea -- from such countries as the US, the UK, Germany and Swiss were selected for the 27th edition of the awards this year. According to Montblanc, Choi was selected for supporting more than 165 cultural and arts projects through exhibitions and performances as the head of the Paradise Culture Foundation since 1997. “It’s an honor to receive the award. Through this award, I will put more effort to wholeheartedly and actively support activities in arts and culture,” said Choi after receiving the award. The ceremony was held at the resort complex Paradise City in Incheon, which opened its second round of arts and entertainment facilities last week. Paradise City also unveiled additional artworks such as those by American pop culture artist Jeff Koons and curated by Korean creative director Chung Ku-ho. Touting itself as an “art-tainment” resort, Paradise City plans to exhibit 2,740 art pieces. Most of them are already on display, including works by British conceptual artist Damien Hirst and Alessandro Mendini.